I do not like Maslow’s hierarchy of needs. I don’t like it because it’s made up, yet people treat it as a universal law. But it’s an invention. It’s an interesting invention but we’ve taken it to be definitive, which it isn’t. Maslow made observations, mostly about American culture and formed them into a framework we often take as predictive for the entire species. There are plenty of other frameworks, including ones that recognize needs are not hierarchical, an observation about your own life that’s easy to make when you stop to consider: do you organize your meals hierarchically? your day? your week? The worthy long and short term ambitions you have likely cut across the “hierarchy” in dozens of reasonable ways. Recently Carr wrote about the arc of innovation, suggesting that there’s a hierarchy of innovation much like Maslow’s. Carr does point out some of the hierarchy’s flaws, but he still, maddeningly, uses a triangular hierarchy for his model for innovation. (It’s like the insanity of people making everything into periodic tables. What is wrong with you people?) It was always dumb that Maslow, if it was his choice, made it a pyramid. Why is the top level so small? is it really smaller in space? Does the smaller size suggest it’s easier to fulfill? What does it mean? It’s just bad design. Anyway, the thrust of Carr’s post is about the diminishing returns of modern inventions, and here I agree with him. The common gripe is the rate of change today is faster than ever, but that’s perception. It feels that way certainly, but the amount of change is smaller than in the past. The leap from steam power to electricity was larger than anything we experienced in modern times, bringing cheap power into workplaces and homes, granting nighttime lighting (which redefined sleep itself!) and thousands of things into the lives of ordinary people. The move from a telephone to a cellphone, as impressive as it is, is far less of a shift and it’s impact smaller on the important parts of our daily lives. This is an opinion of course as all comparisons of the value of two innovations always are. I love the internet, but when you break down how important it is compared to running water, electricity, a nearby market with food, stable democracy, reliable health care and hundreds of other older innovations it’s not even close. Part of the problem is smaller breakthroughs, like a bigger screen for your phone, are made incredibly visible through billions in marketing dollars, whereas more substantial improvements that are less profitable are barely noticed (or would have to have the same financial support to become noticed). There are plenty of holes to poke in Carr’s hierarchy. Healthcare, which would be at the bottom of the pile, constantly sees technological breakthroughs. It’s just that unless you are sick or know someone who is, these breakthroughs do not make the news and are never part of the consumer marketing machine. And of course many inventions slice through the hierarchy, as an app that lets you work with friends by playing games to watch your diet hits nearly every level in one fell swoop. Innovation is relative, not universal. There is no universal index of progress. America is still struggling to provide universal health care, while many European countries already have it. Japan has fast trains, America does not. Progress and regress are always shifting around the world, and with countries, cities and neighborhoods. There is no universal constant. Even now America is divided on who has access to what innovations. From this perspective innovation in some third world countries is at an all time peak. This is why grand arguments about the pace of innovation are esoteric, and reflective of an overly academic perspective on reality. Decline of research funding. 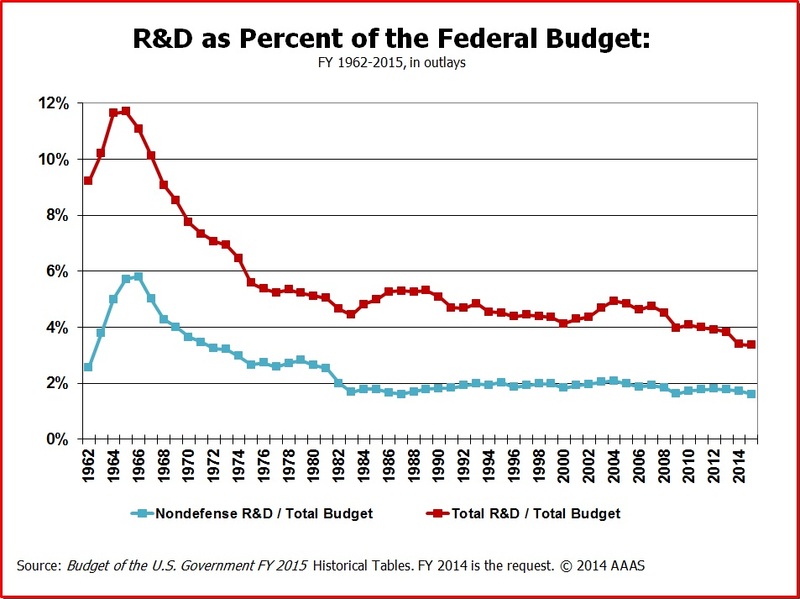 The peak of U.S. Federal spending on science research and development was in the 1960s. Every major invention that makes up the internet was developed decades ago. It’s science where true breakthroughs happen, and by breakthrough I mean the acquisition of new knowledge. It takes years, decades, for that knowledge to be converted into products or solutions, and we may have ridden out the major wave from 50 years ago. Who is investing in the next wave for all of us? It won’t be a corporation (although what Tesla did is interesting). There are only financial rewards for some breakthroughs. The marketplace will rarely invest in true discoveries since they are far too expensive to find. It’s possible that the most transformative technology advancements require government support as no corporation could ever afford to develop them. The best ideas don’t necessarily become popular. We have faith that progress is a straight line, but history makes clear it isn’t even a line at all. A slowdown in technological advancement might be because of other factors, social, political (The last Congress passed fewer laws than any in history) and economic, that have nothing to do with the invention or ideas themselves. Consumer culture has shifted our perceptions on innovation. Will the latest cell phone improve your contributions to social justice? Will an app upgrade save your marriage? Strengthen your community? America is more of a consumer culture than ever before, and that is part of Carr’s point: “We’re getting precisely the kind of innovation that we desire – and that we deserve.” But then the issues are philosophical, not technological. How did we become so shallow and lost? Were we always shallow and lost? The answers are not going to come from technologists and businesspeople. Infrastructure is hard to replace. My point about the primacy of running water and electricity is really about infrastructure. You only get one chance to make certain choices about a city, or a nation. It’s extremely expensive to change these large decisions later, or even with the money on hand, it’s hard for a government to bet on a new approach. The 1950s was when America made its big bet about transportation, and we chose cars over everything else. Which suggests that American may be past it’s innovation prime. Our infrastructure was among the best in the world in 1965. But now, we’re in trouble. It’s a mature nation, with aging technology infrastructure, and bureaucracies and traditions that inhibit big changes. The U.S. is 10th in the world in providing broadband internet, something we basically invented. The future of big advancements might be shifting, or have already shifted, to countries with hungrier cultures. We need to reinvest, but do we have the will? There are limits to progress. There are limits to innovation even if we’re not sure what they are. We have faith there are always ways to make things better, but that faith may be unfounded. We’re aware that the speed of light is the fastest possible thing in the universe: why can’t there be other maximums, like for computer power or algorithmic complexity? There is no way to know for sure that there are more discoveries to make, just as there is no way to know for sure that their aren’t. Marcus Timson January 26, 2015 at 1:30 pm. Permalink. As ever, great insight. It’s true that we assume change today is commonplace but to a large extent that is simply because we keep telling ourselves that this is the case – then there are plenty of marketing dollars telling us that a slight improvement is game changing. To some extent, why does it matter? The pace of life, the access to information does drive the perception that we are more innovative than ever. My view is that breakthrough innovation occurs when there is pressure and focus and more often than not, this is when we have no choice but to innovate. When the economy is ticking along nicely, why bother? Humans largely do what they need to do to survive and live a comfortable life. In my industry, Europe leads the world. There are a number of reasons for this, but I firmly think that this is underscored by the fact that Europe suffered more than any other key economic region through the recession. We have no choice but to innovate. So perhaps there is a new wave of innovation on its way borne out of necessity? I wonder if there is a direct correlation between economic adversity and innovation? Scott January 26, 2015 at 2:19 pm. Permalink. There are correlations between recessions and waves of progress, it’s just not entirely clear what they are. During recessions government programs are often created to spur economic growth. And as you point out there are also psychological motivations to change when the economy isn’t doing as well. But it all becomes moot in a way – human nature is to try new things, and at all times in human history there was progress of some kind of another (and also, simultaneously, regress). Mark Maloney January 26, 2015 at 1:44 pm. Permalink. Thanks for the well-deserved comment on Maslow. His theories can be disproved just by walking down the street and observing what people–from homeless drug addicts to unemployed people driving expensive new cars–spend their money on. I once worked part-time in the debt collection area of a major credit card company and was astounded when I looked at statements after speaking with people on the phone. Some folks can’t pay their electric bills, rent, mortgages, water, heat, etc. (the base of the triangle), yet spent thousands on luxury clothing and even gentleman’s clubs. Maslow should have gotten out more. As for US infrastructure, there appears to be a bad side to even the best things. Our mainland has never been attacked in a war (except the Civil War). Not being bombed into rubble is great for surviving, but bad for replacing outdated railroads, bridges, hydroelectric dams, etc. The horrors of war forced Japan and Europe to rebuild — with the latest, most efficient technologies. Destroying outdated, inefficient, high-pollution infrastructure won’t be done by politicians. Perversely, what was good for my family turned out to be bad for the planet. RJ January 28, 2015 at 6:25 am. Permalink. Mark, what poor people spend their money on HAS NOTHING TO DO with what their needs are. It is uncanny how people, and especially right-wing people it seems, completely misunderstand what Maslow’s hierarchy means. Also, you completely fail to have any empathy and to understand that one can buy an apparently useless item because in their psychology it fulfils a role at a completely different level than what you think. Moreover, a thing like paying the bills is entirely a construct of our society and not at a more fundamental level than self esteem, in the HoN. Animals don’t pay bills. So it can’t be very fundamental, can it. Sean Crawford January 26, 2015 at 8:50 pm. Permalink. You make a good case for a liberal arts education. When the “military and interstate highway” was tearing up neighbourhoods, then as you would say, it was not the corporations that questioned whether saving ten minutes was worth it, but it was folks in Boston (how symbolic, since Boston has so many campuses!) who first said the interstate could darn well go around the city. A PBS documentary showed corporate highway worker after worker saying they had never questioned the roads. I have seen Maslow’s thing as a step ladder at least once. As for the narrowing of the pyramid, as a student I figured that meant there were less self actualized people in the general population. And, like so many freshmen, I resolved to one day make it there myself. Phil Simon January 27, 2015 at 7:20 am. Permalink. RJ January 28, 2015 at 6:18 am. Permalink. I liked your article, as usual, but your comment about you disliking Maslow’s HoN left me confused, and I think it would deserve a separate and deeper discussion. The way you touched on this topic here seemed very unconvincing. What does it have to do with it if one organizes their meals hierarchically? The HoN is meant to organize different types of needs according to how fundamental they are and to their interdependencies. That organization makes no sense for meals. Moreover, the article you pointed to, about social connection being missing, and more than that, at the center of a new model of needs, is very poorly argued. The author confuses needs with tools, and proposes a model that is ultimately much inferior to Maslow’s. Yes, the role of social relations can be highlighted better in the HoN, both as a need and as an enabling tool. And so is intellect and a bunch of others but the author makes a lot of confusion and seems to not understand the HoN very well to start with. Read the comments to that article. It’s a rare occasion that I strongly disagree with something you post, and I’d be curious to read your in depth article on the topic. Greg Robinson January 28, 2015 at 9:42 pm. Permalink. You say hungry cultures are reinvesting. Africa is a perfect example. Power generation is the infrastructure that is preventing African economic growth. Governments are borrowing billions to create such infrastructure. South Africa has an unfortunate history that the government consistently blames apartheid for their incompetence. Private power generation and selling that power to the grid is now where innovation is in this sector. Especially in solar farms, which brings me back to agree with your point on, slowdown of the global economy slows down investment. I do however think that this pushes us to innovate with less. Charlotte Hillier January 29, 2015 at 5:46 pm. Permalink. Interesting post – and I’m with you in disliking the pyramid. Although apparently, Maslow himself never used a pyramid to represent the hierarchy – who knew? Scott January 29, 2015 at 7:34 pm. Permalink. I was going to research that – do you have a link about who made it into a pyramid? I’ve read some of his (other) work and it seems odd that this thing is the thing he’s most famous for. Charlotte Hillier January 30, 2015 at 3:14 am. Permalink.